Psst! Hey, you! Parent of a youth sports athlete. Yes, you. Um, I don’t know how to say this, but your kid is probably not going to get that big shoe contract you’re thinking about. Odds are against them even getting a college scholarship. More than likely, they won’t even play/like this sport when they get to high school. Too often we hear in the news about parents fighting at a sports event, a parent who attacked a referee or the parent whose sworn enemy is the coach who isn’t developing their child properly. Honestly, isn’t one story about this too many? Don’t get me wrong, I’m competitive. I bet I’m more competitive than you are (see what I did there?). However, youth sports is not the place for someone to live vicariously through their child. Nor is it an investment for college. Youth sports should be fun, educational, and healthy. It is not fun when you yell at them when they aren’t the MVP every game. It is not fun when you embarrass them by criticizing the referee, coach, other parents or other players. It is not fun when you put pressure on a little kid to win every time. Personally, I learned after the first softball game this year that I needed to change. The coach’s inexperience was evident by the fact that the girl playing second was on the wrong side of the bag for two innings, and no one told her. I thought I would “help” by giving advice to my daughter. I saw the embarrassment, so we talked after the game. She didn’t want that, so I spent the rest of the season fighting the urge to correct her swing or move her into the better position. The reason so many kids quit sports is because of coaches and parents who do not make fun a priority. I love sports because there are so many life lessons that can be taught through sports. The first one that probably comes to mind is teamwork, but I think a more important lesson is obeying authority. Even if they go pro in that sport, they are going to need to respect authority. I consider my coaching season a success if the kids have fun, and if they are better at listening than when we started. I will ignore all other stats. Complimenting the extra pass, good defense, being in the right place or even helping someone up that fell are ideal ways to nurture the concept of teamwork. Don’t make the first thing you say about their game relate to how many points/touchdowns/homeruns/goals they achieved. Instead find ways to positively reinforce good qualities rather than good athleticism. Acknowledge the process of good work rather than flashy achievements. Finally, teach them respect. Respect for the players, the coach, the referee, other parents, and the equipment. In our small town, older kids referee the younger kids’ games. Thank the officials for their time. Encourage their self-confidence and continued involvement. NEVER yell at them. Remember, it’s a game, and they are human. Encourage respect for the coaches by not criticizing them, getting to things on time, and informing them when you won’t be there so they can adjust the roster. Lastly, don’t overlook the importance of health. Our country is losing the battle with obesity, and it is critical they learn healthy habits when they are young. Teach them about eating healthy (including the snacks afterwards), preventing injuries and hydration. Make sure they understand proper form and knowing when to say “enough”. Promote being active, and always make sure they HUSTLE. It’s another one of those life lessons. Youth sports Sports are nothing more than a game. You can gain and learn a lot from them, but don’t take them too seriously. Enjoy the comradery. Enjoy the time with your kids and the rest of your family. Teach them things that will be beneficial long after they stop wearing their jersey. Excellent thoughts, Sean. We are just beginning our youth sports journey and for those of us who haven’t been exposed to it since we were kids ourselves, its quite shocking to see how the landscape of youth sports has changed. Travel teams and “elite” programs prey on the notion that your child’s only chance of success is to commit as if they were an Olympic bound athlete. It seems that many parents are afraid that they’ll miss the opportunity to have a super star instead of taking the more likely path of using the sports experience to teach their children important life lessons. Hopefully we all make the right choices and find our children the right program to lead them to become the people we want them to be. Thanks Jamie. Even Olympic success is relatively short lived. Life lessons are for life, obviously. Let’s hope we don’t get distracted when making decisions. I am totally on board with this. I have a 13 year old soccer player. After a game where the other team’s parents were yelling constantly to their kids I asked my son, “Do you hear anything that parents say from the sidelines?” He said, “no”. I then asked, “if you did hear us would you do what we say?”. His answer, “nope”. It reminded me of the time I used to be like these other parents. 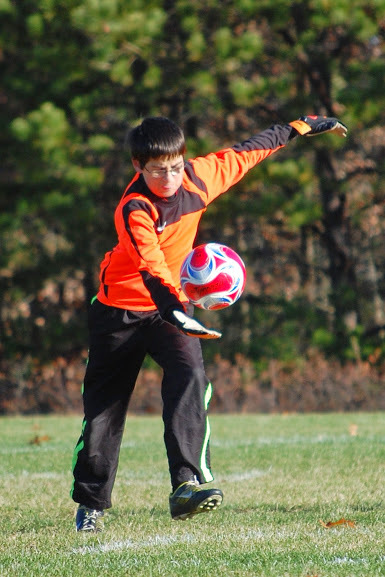 I yelled to my son when he was playing keeper, “you need to get in position, Luke”. He yelled back, “I got it Dad!”. And he did, and I finally ‘got it’. My parent friends on the sidelines really gave it to me that day and I have been a much better sideline parent quietly eating my concession hot dogs, popcorn, and gummy worms.